Recycling Lives is a recycling company which pledges to 'use your waste to transform lives.' How exactly can waste transform lives? Regeneration is at the heart of what Recycling Lives does. Its metal and waste recycling services sustain the Recycling Lives social welfare charity, which tackles homelessness and unemployment through accommodation, education, training and work experience. The focus of the Recycling Lives charity is to help some of the most marginalised individuals in the community into employment and independent living, allowing them to rebuild their lives through a Six Stage process in a safe and constructive environment. Through the programme, unemployed, vulnerable men over the age of 25, including ex-armed forces personnel and ex-offenders, are provided with accommodation and support. 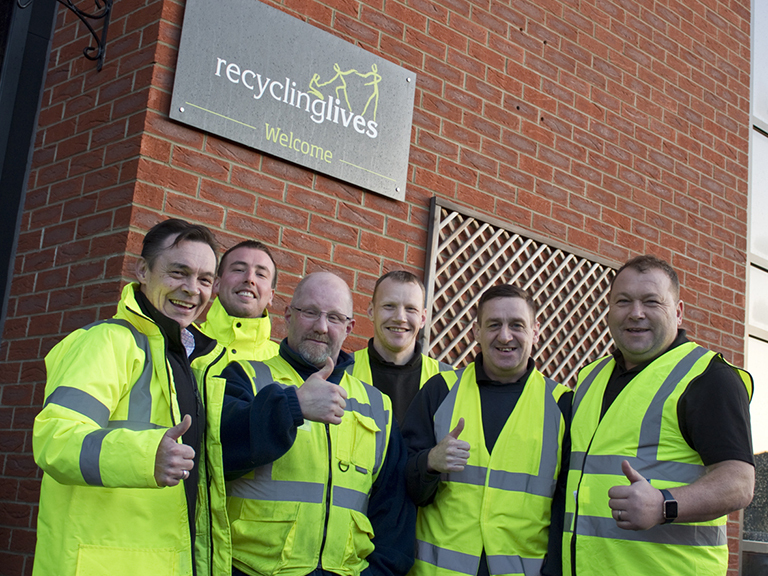 The Recycling Lives business offers the charity's residents employment opportunities to help them move beyond the long-term unemployment they were facing. Recycling Lives also provides training, work experience, support and guidance to individuals in custody through their HMP Academies, in seven prisons. These have created employment for 150 men and women in prison. The aim of the HMP Academies is to instil in ex-offenders the tools and skills required to successfully integrate into society in a fulfilling and productive way. 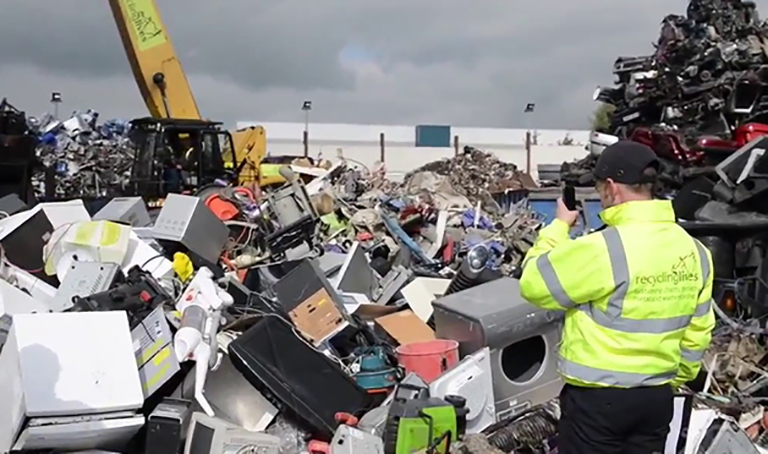 Within the HMP Academies, Recycling Lives operates electrical equipment recycling facilities, including Flat Panel Display and other IT equipment dismantling. Full training is provided to ensure the programme is appropriate for all abilities, and all training is delivered by experienced staff. Inmates are paid and enhanced wage for the work they do, with 40% of their earnings going towards victim support funds. Those on the programme also have the opportunity to earn formal qualifications (e.g., NVQ Level 2 in recycling). The skills and experiences gained and the work ethic developed improve the employment prospects of the individuals engaged in the programme, better preparing them for employment opportunities on release. They also have access to career advisors who can help them progress along their chosen career paths. Additionally, participants are given support to access other work opportunities if granted ROTL (release on temporary licence). Once released, Recycling Lives offers participants through-the-gate support. This includes opportunities for further training and full-time employment, either within its own business or with corporate partners, as well as accommodation if required. 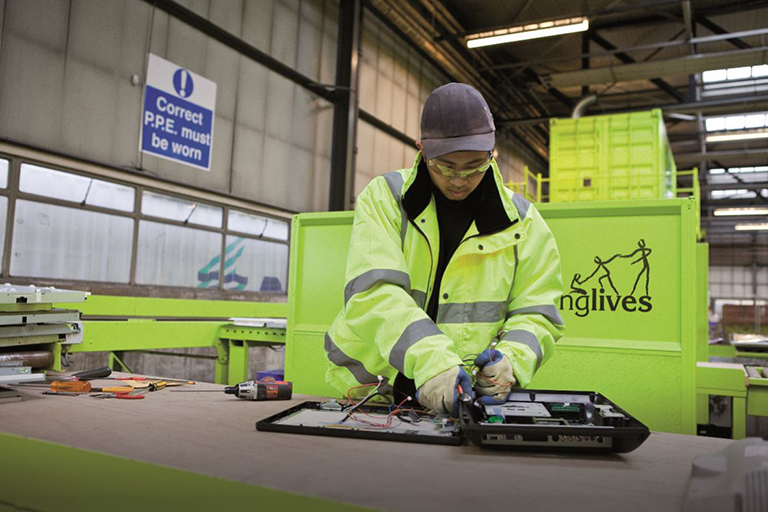 Recycling Lives is a leading member of the Employers Forum for Reducing Reoffending (EFFRR), a core forum of local and national employers designed to improve the recruitment practices of employers and the employment prospects of ex-offenders. Alasdair Jackson, Recycling Lives' Operations, CSR & Sustainability Director, is their representative on the forum. Not only does the work that Recycling Lives does sound great in theory, but in practice it has shown to be very successful. It has seen a 94% success rate in preventing reoffending. That's a reoffending rate of just 6%, in comparison to the national average of 60%. This year, by increasing the number of operational HMP Academies, it hopes the number of participants will rise to 260. Furthermore, Recycling Lives was awarded the Queen's Award for Enterprise in Sustainable Development for its provision of training and employment centres operating within these HMP facilities. Ian's story is a fantastic example of how Recycling Lives has been able to help individuals transform their lives. Ian had spent years using hard drugs and offending due to his addiction. He had a criminal record, limited work experience and had felt forced to leave his hometown due to the shame of his lifestyle. He was now facing a 20-month sentence in HMP Lancaster Farms and knew it was time to change. “I was in limbo when I went to prison – I'd lost everything. I was at a point where I was ready to change my life but I had no direction or motivation to do so. Until I met Recycling Lives." While Ian had worked in prison before, he'd never felt any sense of purpose or future prospects from his jobs. He was quickly promoted, not once but twice, to be a peer mentor, teaching other offenders how to do the work, and then shop supervisor. Working daily gave him a strong work ethic, learning 'soft' work skills such as time-management and communication skills. He also had vital support from his peers and managers to detox from opiates. Upon release, Ian moved into Recycling Lives' other rehabilitation programme, its residential charity. Today Ian is living in settled accommodation and working full-time at Recycling Lives' Recycling Park, managing his own department with aspirations to become a crane driver. And perhaps most importantly, he is reconnecting with his family. “My family are proud of me. I'm so excited for what's ahead."